Miriam Marx Allen. Love, Groucho: Letters From Groucho Marx to His Daughter Miriam. 1992. ISBN 0-571-12915-3. Charlotte Chandler. Hello, I Must Be Going!. 1979. ISBN 0-14-005222-4. Stefan Kanfer. 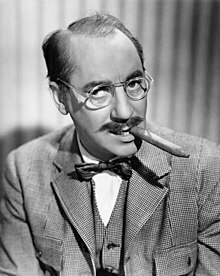 Groucho: The Life and Times of Julius Henry Marx. 2000. ISBN 0-375-70207-5. Simon Louvish. Monkey Business: The Lives and Legends of the Marx Brothers. 2001. ISBN 0-312-25292-7. Arthur Marx. Son of Groucho. 1972. ISBN 0-679-50355-2. Glenn Mitchell. The Marx Brothers Encyclopedia. 1996. ISBN 0-7134-7838-1. Steve Stoliar. Raised Eyebrows: My Years Inside Groucho's House. 1996. ISBN 1-881649-73-3.